It is possible to be functional and dysfunctional at the same time. There is no better life than one that is organized, and the Brother P-Touch® PT-80 Label Printer can help you reach that goal! 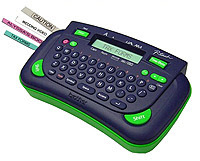 The Brother PT-80 is a lightweight handheld label maker that's easy to use at home or in your office to organize anything from food storage containers to computer cables. You can also label wherever you go at the touch of a button because it runs on 4 AAA batteries. The ability to label "on the fly" has endless possibilities. The PT-80 has a typewriter-style QWERTY keyboard and comes in a fun blue and neon green color. My oldest daughter gets a kick out of using this labeler because of its fun color and the ability to hold it in both hands much like a handheld video game while typing with both thumbs. All these features and more allow you to create specific labels for specific occasions. One special feature of this is that you can adjust size of text to fit longer names, phrases, etc. It's so versatile that it also prints vertically, horizontally, and in large or small sizes. And you can use up to 80 characters on a label. Up to 9 copies of the same label can also be printed which is a valuable function for big printing jobs like labeling school supplies. With all these wonderful features, this model label maker is a great tool for daily home use, for teachers, scrapbookers, and for use in any profession or creative outlet. The PT-80 delivers quality results at an attractive price. So when you think of all the things you can label around your home or office, and how easy and fun it is to use, you really do see the benefit of purchasing a quality label maker like this. A great place to get your new Brother P-Touch PT-80 is at CableOrganizer.com. They have more ways to organize your cables than you can imagine. With their Money-Back Guarantee Return Policy, 100% Secure Ordering, and Fast Shipping of your order within two business days, you can rest assured you're getting the best in customer service for all your cable organization needs. Now if you'll excuse me, I'm headed off to my sisters house to label her world with my new Brother P-Touch PT-80! When Karen Armatrout died of cancer in 1997, her husband, Richard, collected a modest amount in life insurance benefits from her employer, Wal-Mart. But Armatrout claims that, unbeknownst to him, Wal-Mart also collected on a life insurance policy, one the company took out on Karen Armatrout years before without her knowledge. Mary Helen of Corner of the Sky hit me with a meme a couple days ago that involves posting 8 things about myself that no one knows. I have been struggling to find 8 things about me that wouldn't bore a person to tears. My life now is no where near as exciting as it once was. I've settled into myself thanks to a loving husband and two wonderful babies. With that in mind, I'll offer up a few things about the past and a few things about the present. Forgive me for being a name-dropper but most of the exciting things happened when I was around other people. And I have never been able to sum up things in just a couple lines like other bloggers, so you'll have to forgive me for that too. 1. I had a very scary run-in with former Christian County Sheriff L.E. "Buff" Lamb when I was 12 years old. An older girl that lived down the street from me decided it would be a good idea on a boring Sunday afternoon to hang out at the local post office and break into some wall boxes and look at other peoples mail. Although I didn't actually break into the boxes, I was inside the post office with her when the town cop walked in to check his mail. We were busted. That next Monday morning, my mother and I spent a good two hours at the desk of Buff Lamb while I cried my eyes out and got a good talking to from him, while the girl I was with spent 3 months in the local jail. There ends my short-lived life of crime at the age of 12. 2. I helped open the Hemingways restaurant to the public. During that time, I delivered Johnny Morris' lunch to him in his personal office. Before the restaurant officially opened to the public, we had a couple Christmas parties for Bass Pro employees and friends of Johnny's. Oh, the stories I could tell! 3. I met the band, Bon Jovi at the old record store Liberty Sound back in 1985 when they came to Springfield for a concert at Hammons Student Center. They opened for another band, Ratt. I am working up a post with pics and the whole story behind this exciting day in my life. I still think Jon Bon Jovi is the hottest thing on two legs these days.....and Tim Tialdo. 4. I have been married once before. I am the ex-wife of a certain Greene County Deputy Sheriff who is running for the office of Sheriff next year. Again.....Oh, the stories I could tell! But I won't. 5. I once had to testify in court against a man with one arm for shoplifting from a convenience store I worked at for many years on the corner of Hwys M and 60. The one-armed bandit decided to pilfer a bottle of whiskey on a Sunday afternoon when liquor sales were banned on Sundays. In the end he was convicted and fined $25. What a joke! 6. I am currently the daughter-in-law to a local pastor of a small church. Hence the reason I do not discuss religion....with him or anyone else. I prefer to keep peace in the family rather than stir things up. 7. I love to bowfish and geocache. My husband introduced me to bowfishing when we first met. Before I met him, I had never heard of such a sport. But it's very fun and exciting. Especially at night. Our business now holds the largest bowfishing tournaments in the state. I came across geocaching through an online friend. It's addicting and fun. Although I haven't been doing much geocaching since I had my youngest last year and with gas prices being so high, it has turned into quite an expensive hobby at the moment. But I can't wait to get back into it once things settle down some. 8. I am a Survivor addict! I have seen every show of every season except two. I have auditioned for Survivor but have never received a call-back. I would go on that show in a heartbeat. I met Rupert at a car show a couple of years ago and we got our picture together printed on the front page of one of the sections of the NewsLeader. He was as nice in person as he seemed on the show. I was so nervous meeting him. So there you have it. Quite boring, huh? Despite that, I like these meme tag things. I read so many local blogs and this tag thing has been around for a while, so I don't know who has been tagged and who hasn't. I think I will try tagging a newcomer to the blogging world, Louis from the Relevant to Me blog. I'll also tag my old geocaching buddy, Amy from GentleWhisper. And throw in Doug from Move And I'll Shoot. Larry at Simple Thoughts of a Complex Mind will be tagged too. There's 4. Gotta leave some for them to tag. FYI: For more things about me, check out a post I made when I first started this blog. I have yet to finish it. Wow...amazing how much has changed in the short time since I wrote that. I foresee an update coming soon. An eclectic blog with a little bit of humor, a little bit of reality and a little bit of life. Gimmicks like Blog Awards are about as meaningful as the Oscars, mostly good only for self-promotion. I'll leave those shenanigans and ceremonies to the old farts. There are lots of great local blogs out there that will never be nominated because you don’t even know they exist. This is not one of them. This is just me. I don't blog for recognition. Recycle, Reduce, Reuse, Repair, Rethink, Retool, Reinvent, Resist, React, Respect, Revere, Reflect, Refill, Reclaim, Recharge, Rekindle, Reform, Refresh, Restore and Renew! Um, yeah.......it IS all about me!